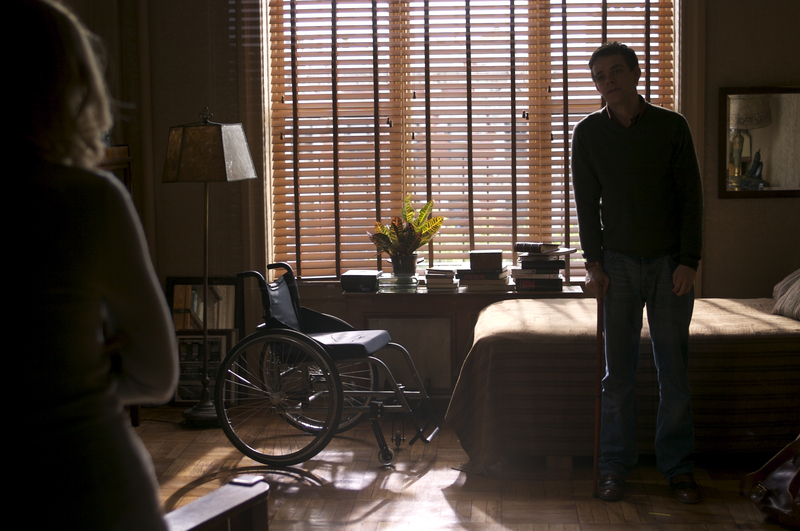 Quid Pro Quo centers on a young reporter who is left partially paralyzed from a car accident early in his life. The catch? His story is to investigate the subculture of able bodied individuals who “wannabe” paraplegic. His journey into this bizarre and perverse world leads him to meet and fall for the mysterious Fiona, who owns a wheelchair despite being fully functional. Quid Pro Quo had its debut at Sundance earlier this year to positive reviews and will be premiering this Friday in the Walker cinema. Producer Sarah Pillsbury, whose credits include Desperately Seeking Susan, and The Band Played On, and Oscar winning short Board and Care will introduce the film and participate in a post screening conversation. How did you get involved in filmmaking and who are your major influences? I have loved movies all my life and remember so many wonderful experiences: graduating from matinees at the Wayzata movie theatre to Friday nights (almost every one) with the boys sitting in the row behind the girls; taking the bus to town and going to Orpheum; waiting for the next Cinerama movie, which took me to the Cooper for the first time, where I ultimately saw 2001 and Lawrence of Arabia. But I never thought I would make movies until I was in college and I became a feminist. Suddenly I had to think about what I was going to do when I grew up. I went to Kenya between my sophomore and junior years and realized what I missed most was the movies. Then I met some documentary filmmakers and did some work with them. When I got back to college, I took whatever film courses I could while finishing up a history major, and was influenced by Michael Roemer and Nick Dubb who had done some brilliant documentaries. Both of them along with my professor at UCLA, Bob Rosen, helped me appreciate film even more, and trust my own instincts. They also made me understand the responsibilities of the filmmaker to make every effort to be conscious of what one is conveying on the screen. Even so I am often surprised what people will see or respond to in a movie I’ve made. It’s hard to think of filmmakers who didn’t influence me. I guess I graduated from musicals, to melodramas and romantic comedies, then began appreciating gangster films and noir. Eventually I became more aware of the vision, social comment or satire of the filmmakers. In college I was introduced to a lot of great European films and was especially drawn to Italian neo-realism and British dramas and comedies, the more romantic French films, as well as some of the more disturbing work. I was captivated by the new American films that Peter Biskind writes about in Easy Riders, Raging Bulls. After I got to LA, there were still many great movies being made The Candidate, Chinatown, Coming Home and Missing, that made me believe that I could make movies that were about important issues, but still great drama or comedy. What factors influence the project you have been or are involved in? What was it about this project that was compelling to you? I want to go somewhere I’ve never gone before or see something in a new way. It’s about characters whose stories, which almost always involve, personal journeys, whom I want to spend time with – it takes a long time to make a movie. It’s a long term personal commitment to characters you want to bring to life, and see interpreted by wonderful directors and actors. I want to see people mature and find redemption and purpose, and to learn to forgive and accept themselves and others. I want people to see that often what seems unusual is often quite universal and relatable. Were you apprehensive about how audiences will respond to the films “sensitive” subject matter? What do you hope audiences will take away from the film? I always want people to enjoy or be transported. And of course, I want good reviews – anything to get an audience. But the only time I recall being truly apprehensive was when we made a movie about an adoption and I was concerned that people would interpret the movie as glorifying the decision of the young woman to give up her child as opposed to having made the choice to terminate the pregnancy, and indeed, despite our inserting dialogue supporting a woman’s right to choose, some people still saw the film as anti-choice. I am not deliberately provocative, but I want people to be stirred up, ask questions and come to their own conclusions. While I don’t think that we’ve every obscured what we think, we don’t want to tell people how to think. In the end, I want people to have the kind of experience I have always cherished. To be lifted out of their lives, taken somewhere new or see something familiar in a new way, meet some people whose stories, perceptions and dialogue will stick with them for awhile, and then, when the lights come up, they will be set back again in their own life with more perspective and compassion for themselves and others.